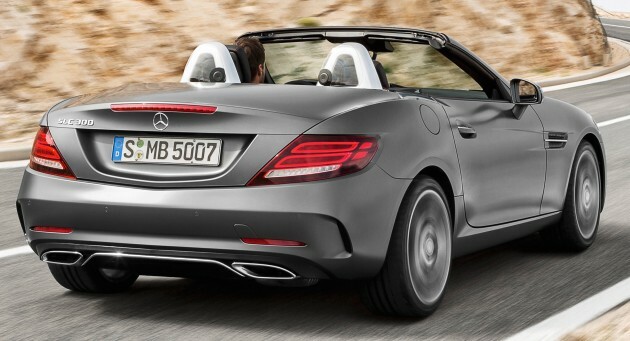 The new Mercedes-Benz SLC has been revealed ahead of its Detroit Auto Show public debut. Spied on several occasions before, the new Mercedes-Benz SLC is simply a facelifted R172 SLK roadster. The new moniker in is in line with the brand’s latest naming strategy, with the “C” in SLC reflecting the roadster’s close ties with the C-Class. The styling updates start up front for the new roadster, featuring a standard-fit diamond radiator grille and revised headlamp designs with the LED Intelligent Light System optionally available. Slightly slimmer tail lights with new graphics feature at the rear, while the rest of the car remains largely as before. On top of the standard look, AMG Line and Night Package styling fitments are also optional, respectively adding sportier bumpers, side skirts, wheels and high-gloss black finishing. Wheel options range from 16- to 18-inch alloys. Mercedes-Benz has also updated the SLC’s vario roof mechanism, allowing it now to be operated at speeds of up to 40 km/h. Spec the optional vario-roof convenience feature or the Keyless-Go system, and you’ll also get an automatic boot separator. The separator creates more boot stroage capacity, and automatically moves down when the roof is opened. If not enough space is available, a warning message will appear on the instrument cluster. The interior of the car is also largely similar to the pre-facelifted R172 roadster. The COMAND Online infotainment system has been updated with new graphics, improved navigation and features the latest Mercedes-Benz apps. The dashboard-integrated display screen is also larger as standard, offering a seven-inch screen in place of the previous base 5.8-inch unit. The rest of the car remains largely the same, save for two new interior colour options. A new saddle brown colour can be specified with the nappa and Exclusive nappa leather. The new platinum white option can be had with the same upholstery, but is also available for the designo nappa and Exclusive nappa leather. The SLC also continues to offer its Magic Sky Control option, allowing for the glass roof to be lightened or darkened to suit exterior lighting conditions. Also, just like its S-Class Cabriolet, the SLC also gets an Airscarf neck-level heating system. To match its subtly updated looks and tech, Mercedes-Benz has also introduced a new base SLC 180 variant, and positioned its range-topping AMG model as the SLC 43. That also means a goodbye to the SLK 55 AMG and its 5.5 litre naturally-aspirated engine. The SLC 180 features the brand’s 1.6 litre turbocharged four-cylinder engine which puts out 156 hp at 5,300 rpm and 250 Nm between 1,200 and 4,000 rpm. Next in line is the 184 hp/300 Nm SLC 200, featuring a 2.0 litre four-cylinder turbo engine. The more potent version of the 2.0 litre turbo-four takes shape in the SLC 300, which offers 245 hp and 370 Nm of torque. The sole diesel SLC 250 d features a familiar 2.1 litre four-cylinder diesel engine that deals 204 hp and 500 Nm of torque. 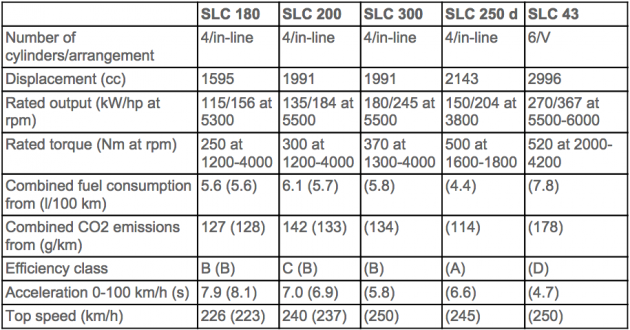 For more performance specifications on the new line-up, refer to the chart above. Likewise, if you’re looking for details on the AMG SLC 43, you can check out its report here. All variants of the SLC roadster, including the AMG SLC 43, will be offered with a 9G-Tronic torque converter automatic transmission as standard. All cars will also get a sum of five driving mode options under the Dynamic Select system, being Comfort, Sport, Sport+, Eco and Individual. For more athleticism, the SLC can be specified with an optional Dynamic Handling Package. The performance upgrade lowers the car’s chassis by 10 mm, adds an adaptive suspension system and a special ESP Dynamic Cornering Assist feature. Prices for the new Mercedes-Benz SLC roadster will be announced mid-January 2016, where the car will also debut alongside the new W213 Mercedes-Benz E-Class at the coming Detroit Auto Show. Ive never realised much in photos except after i drove my uncle’s 2014 SLK…the offset aircon/LCD which is a huge eyesore while in the car. Luckily only 1 passenger will notice it when they step in.